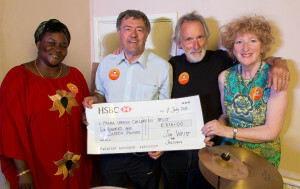 WELL known local drummer, Jim White, gathered his jazz friends to play at the Granary on Sunday 7th July as part of the Frome Festival. Jim White, with the previous chairman of the charity, Martin Bax, presented a cheque to Sarah Hillman, president, and Janet Millar, the new chair, for the proceeds of the night. The small stage was packed with stunning talent and the audience were treated to inspiring and entertaining jazz. 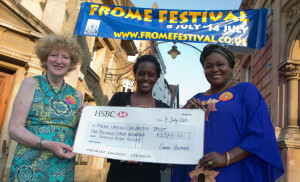 The organisers would like to thank the Frome Festival for their support. THE popular Frome Festival Food Feast was blessed by hot sunshine and Sarah Hillman and her big team of family and friends produced her usual fabulous East African food for the crowds. Sarah had been chopping and cooking for two days and a record amount of African food was consumed on the hottest day of the year with queues all along the river bank which were animated and entertained by the Frome Street Bandits and Acoustic plus. The profits of her hard work are in aid of The Mama Upendo Children’s Trust. £1,367 was raised for the orphans and Sarah travels to Kenya next week to deliver this. Every single penny goes to the children in Kitui.